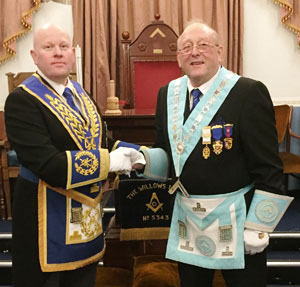 As a former Warrant Officer in the Royal Engineers, Mike Hodgson being installed into the chair of Willows Lodge No 5343 delivered the warrant into a pair of very safe hands. Malcolm Bell congratulates Mike Hodgson on attaining the Chair of King Solomon in Willows Lodge. It was a well-attended gathering at Bryn Masonic Hall. Local grand officer (and Provincial Grand Director Ceremonies designate) Malcolm Bell was the principal guest, accompanied by group chairman Geoffrey Porter and fellow grand officer Graeme Hughes, all supported by acting Provincial grand officer Eric Bailey and group charity steward Ian Green. Installing master John Thompson, completing his second spell in the chair, with his usual skill and keenness, commenced what was to be a thoroughly wonderful performance to place his enthusiastic successor into the chair. 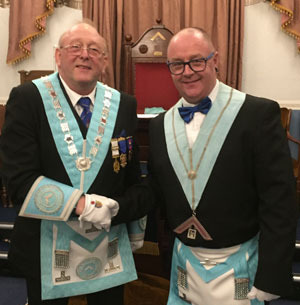 Malcolm Bell, and all assembled, were treated to a delightful ceremony of installation, and Malcolm was greatly impressed, lavishing praise on the installing master and all the officers who took part. Mike Hodgson (left) thanks installing master John Thompson. Worthy of special mention was how pleasing it was to see the working tools delivered by Daryl Millman, Tony Flynn and Jeff Burns in such fine fashion. Arthur Robinson gave the address to the master, whilst Malcolm Bell addressed the brethren of the lodge. The address to the deacons was given by the acting Provincial grand officer Eric Bailey. Graeme Hughes, lodge member and past acting warden in the Province of Cheshire, delivered the address to the wardens. Malcolm brought the greetings and congratulations of the Provincial Grand Master, and congratulated Mike on taking the chair in such a fine ceremony, commenting that to him, Willows Lodge just seem to be doing everything right and going from strength to strength. He was delighted to receive charitable donations totalling a magnificent £2,350, consisting of: £600 to the Grand Charity, £350 to Wigan and Leigh Hospice, £300 to the Royal British Legion, £200 for Age Concern, £200 for Newton Community Hospital, £100 in favour of the Air Ambulance Association and £50 to the Christy Charity. Malcolm was extremely impressed by this wonderful charitable effort, and all of Willows Lodge can feel proud of their achievement. Mike has been married to wife Pauline for 49 years and has two daughters and four grandchildren. Outside of Masonry, his hobbies include fishing, watching rugby and socialising. As a former military man, whenever he gets the chance, he likes nothing better than to tour the old battlefields of Europe. Pictured from left to right, are: Geoffrey Porter, Malcolm Bell, Mike Hodgson, Eric Bailey and Ian Green.